This Digital LCD Thermostat Regulator Temperature Controller with 2M NTC Sensors offers numerous features and benefits that enables end users meet the needs of different various operations and applications. 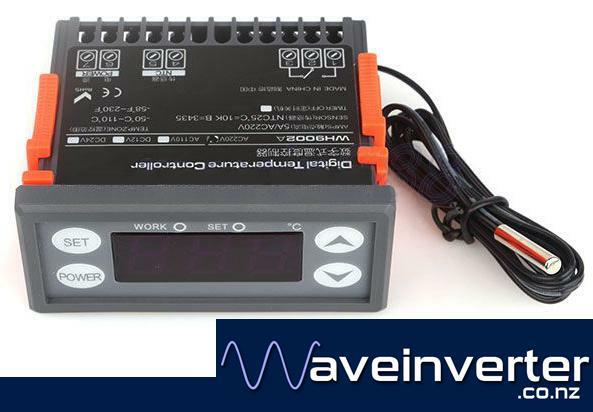 This digital temperature controller is an economical choice when it comes to several applications like food service, industrial and commercial requirements, domestic freezer, water tanks, refrigerator, industrial chiller, bolier, steamer, industrial equipments and other temperature-controlled systems, agriculture, HVAC systems, animal confinement, heating and cooling functions, home brewing, greenhouses, modulating fans and the like. This is our most simple to operate, best value unit. It has stable performance, small size and intelligent control, with cooling and heating controls. PT Compressor delay 0~15 3 Min. We have these in both 230v AC and 12v DC powered versions (check our other listings). Add $10 to upgrade to a 3 metre long probe and $15 for a 5 metre long probe.